Kenpo Karate 5.0 is the absolute best sport to get your child involved in as it encompasses both physical education and character development, and here at Kenpo Karate Auckland our aim is to help them achieve there potential. Here are some reasons why Kenpo Karate 5.0 is the best activity for children. Self-Defence is the primary reason people study martial arts. 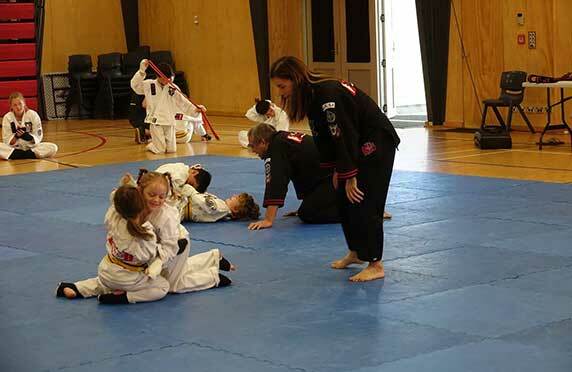 At Kenpo Karate Auckland you learn not just techniques to defend yourself, but strategies on how to deal with bullies and how to de-escalate conflict. Training develops the reflexes needed if a dangerous situation occurs, and the confidence needed to act. Kenpo Karate 5.0 is a modern martial art with traditional values. It has been developed to deal with the possible threats faced in the modern world. Kenpo Karate 5.0 and Martial arts are a great way to help your child develop self discipline. Learning new skills can be challenging and children quickly learn that “practice makes perfect”. Students get drilled on a technique or movement every class and see that with repetition their technique gradually improves. Nobody ever masters something on their first attempt and martial arts are a fantastic vehicle for this message! We let the children know that there are clear boundaries in class, what is and what is not acceptable behaviour. There are rules during sparring or the games played in class and everyone learns how to play fair, a skill which extends past their everyday lives. As children learn new skills in Kenpo Karate and achieve new goals, their self confidence grows and develops. This self confidence carries on outside of their Kenpo Karate classes, into their education and social lives. When a child has developed self-confidence they are positive about their future and know that they can accomplish what they want to achieve with hard work. Having a belt system encourages children to set goals and provides a sense of achievement once their goals are reached. This translates to all aspects of life and teaches children the values of goal setting, hard work and dedication. The feeling of achievement children get when they receive their new belts is unbeatable and helps to encourage positive habits. 5. Nobody watching from the side lines! Team sports teach many valuable skills but the “make the team model” usually favours the more developed, athletic children and leaves the late bloomers feeling rejected as they watch from the sidelines. At Kenpo Karate class, everyone is on the mat the whole time. Some kids are naturally quicker learners and some develop their physical abilities quicker than others, but we find in martial arts that the late developers turn into some of the most amazing technicians with a never give up attitude. Children will often do a couple of seasons in a team sport before moving on, but Kenpo Karate and martial arts provides years of diligent and disciplined practice to bring out a child’s full potential. Kenpo Karate kids classes are fun yet physically demanding. Everyone always works up a sweat and we help our students get fitter, develop strength and improve their coordination with a variety of games, drills and challenges. Kenpo Karate 5.0 is a full body work out every session! 7. Kenpo Karate 5.0 is great for the whole family. Young or old, male or female, Kenpo Karate 5.0 is available to all! We have several families training with us at our club, and the story is usually the same…Mum or Dad see how enjoyable classes are for their children and join as well! This creates a strong bonding tool, as parents can be involved in their child’s hobby. Parents who train can help their children progress, improve their technique and train for grading’s or competitions. Families that play together, stay together! 8. Girl Power! Kenpo Karate 5.0 is also an art where boys and girls learn together. There are females through all our classes. Girls have the ability to become wonderful martial artists and fierce competitors. The girls at the club achieve some amazing results in both national and international competitions. It is more important than ever that girls have the confidence to defend themselves or extract themselves from uncomfortable situations. We have a lot of brother and sister teams at our club. Not many sports let brothers and sisters practice at the same time at the same place (many parents love this) and not many sports let brothers and sisters practice and learn from each other at home. Sports such as rugby, soccer, netball and cricket have limited seasons and it is often weather dependent. Martial arts are available year round, rain or shine. This consistency and availability helps to develop a routine and discipline and the constant practice enables children to progress quicker. Jeff Speakman’s Kenpo 5.0 is a quickly growing worldwide organisation, with clubs all over the world. We encourage all our students to see if there is a school available in the area overseas when they travel, as every Kenpo Karate 5.0 school will open their doors and bend over backwards to make sure you have a great time. Our students visit the schools in Australia on a regular basis, and our club hosts any international visitors that make it to our little corner of the world! As you can see we really love teaching Kenpo Karate and we think it is a great family activity and really good for kids on a variety of levels. As a family we have been training for over 20 years and have had some wonderful students and we have life long friends from when we started – and we are making new friends world wide now. If you have always wanted to have a go at a Martial Art but for whatever reason have not been able to just yet, come along and have a go, you do not need to make a huge financial commitment to get you or your children into Kenpo Karate. Click on the link below to go to our website for more information.